Italian architect Mario Cucinella has designed an innovative new sustainable building in the city of Accra, Ghana, It merges concrete and glass to make a building that will stay cool in the heat of the day. 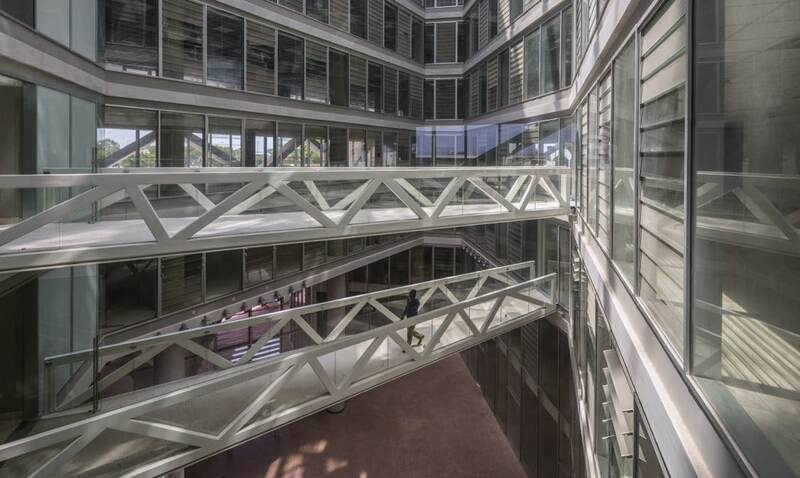 Designed in collaboration with Deweger Gruter Brown & Partners, the clever brise soleil passive solar design allows the building to be bright and open to natural light while keeping out the sun’s heat in the summertime. The sustainable building has already received the 4-Stars award by the Green Building Council of Africa. 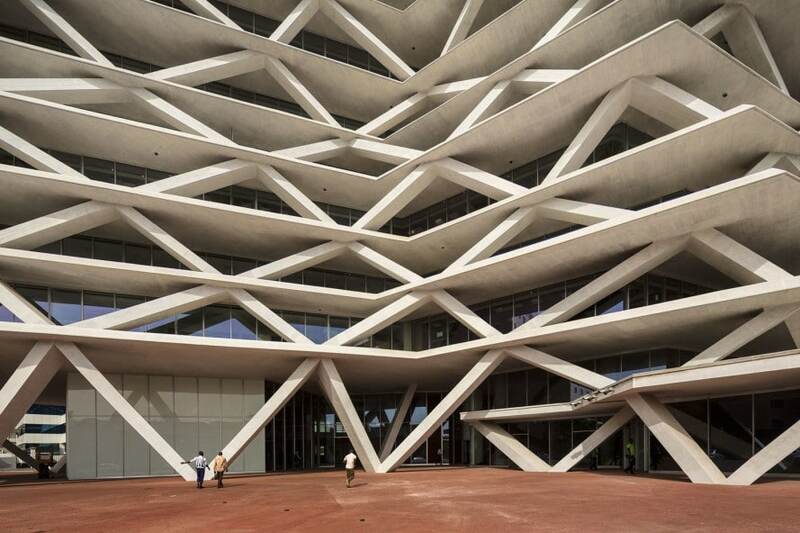 The crisscrossing brise soleil façade is made out of concrete. Inspired by the motifs of traditional African fabrics and the unique patterns of palm tree bark, the design embraces local traditions while being environmentally sustainable. The building’s shell is a combination of overhanging slabs and diagonal frames that shelter the interior from direct sun. The design permits the building’s exterior to be made entirely of glass that lets in light but not heat. The lattice-like concrete also serves as the load-bearing structural component of the building. One Airport Square is adjacent to Kotoka International Airport in Accra. It makes an excellent location for the local population to congregate at any time of the day or night and it plays host to a number of community and cultural activities. The nine story building has almost 200,000 square feet of floor space suitable for offices and stores within its brightly lit interior. Thanks to Cucinella’s unusual design, the amount of cooling needed to keep the building comfortable is significantly less than it would be for a conventional building of similar size. Less cooling means less energy, which helps keep the carbon footprint of the building as low as possible. In Africa, where reliable access to electricity is problematic, reducing the amount of power the building consumes means fewer emissions are created to keep the building temperature at a comfortable level.